Dear applicants, thank you for your interest in studying at our faculty. You have chosen the institution with more than 35 years of history and experience in education, which is ranked as one of the best faculties in the field of economic education in Slovakia. Last year we have celebrated the 25th anniversary of our study program, during which several thousands students successfully graduated. 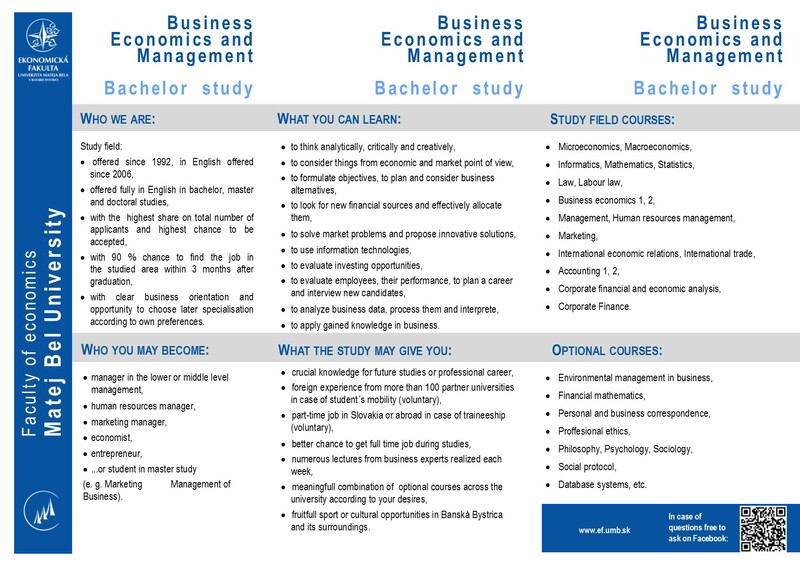 Business Economics and Management (BEM) as a bachelor study programme is an equivalent of study programme “Ekonomika a manažment podniku” (in Slovak language). This study programme has been lectured in English language since academic year 2005/2006 with full accreditation according to law number 131/2002 Coll. about universities. Both programs are strongly interconnected with business practice, courses react on dynamic changes, as the demand at the labour market impose requirements on both students and teachers. You have plenty opportunities to complete your studies with the foreign mobililties or part-time jobs. All these efforts are strongly supported and promoted. Bachelor study is a first level of university studies. Standard duration of internal form is three years. Bachelor study has to be finished by defending of bachelor thesis. Those may be chosen from a great variety of topics according to your own will and usually is practically implemeted in practice. Graduate gains academic title “bachelor” (abbreviation - Bc). Graduate of bachelor study “Business Economics and Management” is able to use knowledge from economics, quantitative methods, law, management and marketing. He/She is skilled in professional communication in English and has practice skills in informatics. Gained knowledge is being deepened by business planning, production management, international trade, financial analysis and entrepreneuring in small and medium sized enterprises. Graduate is also able to solve intermediate problems from calculations, budgets, planning and organizing of business processes. He / She knows basic managerial relations in business functioning and has widespread basement for application of his / her knowledge especially in small and medium sized enterprises. After bachelor study you may continue at our faculty in master study and to choose from several study programs fully or partially taught in English. In case of questions do not hesitate to contact us via e-mail addresses listed on the web pages of our department or to discuss necessary isues on our Facebook page. We firmly believe that you will very carefuly consider all opportunities and choose that field and program, which suits to your needs and expectations. Hopefully we will meet since September in Banská Bystrica.